As we continue announcing plans and details for the 2019 march, we will update this page. For now, please sign on to support our principles for the 2019 march - Individual Endorsement and Group Endorsement. You can also RSVP on Facebook. You can reach the committee planning the march at Logistics@ReclaimPrideNYC.org. We will create a politically engaged Queer Liberation March to mark the 50th anniversary of the Stonewall Rebellion. Eschewing the corporate-saturated, highly policed nature of recent parades, our March is a truly grassroots action that will mobilize the community to address the many social and political battles that continue to be fought locally, nationally, and globally. You can read more in our press release. We March in our communities’ tradition of resistance against police, state, and societal oppression, a tradition that is epitomized and symbolized by the 1969 Stonewall Rebellion. 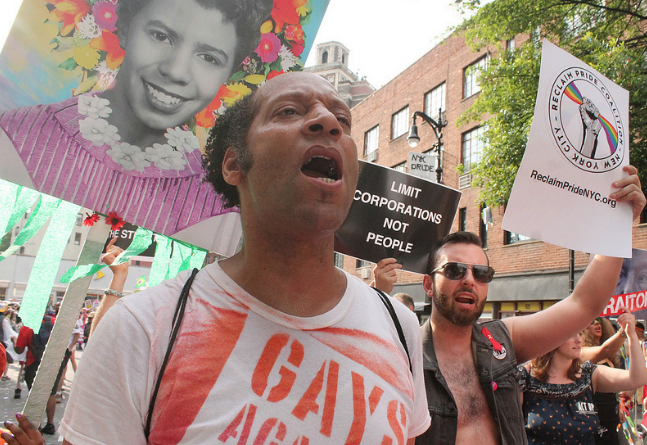 We March against the exploitation of our communities for profit and against corporate and state pinkwashing, as displayed in Pride celebrations worldwide, including the NYC Pride Parade. We March in opposition to transphobia, homophobia, biphobia, racism, sexism, xenophobia, bigotry based on religious affiliation, classism, ableism, audism, ageism, all other forms of oppression, and the violence that accompanies them in the U.S. and globally. We March for an end to individual and institutional expressions of hate and violence as well as government policies that deny us our rights and our very lives, from the NYPD to ICE, from the prison industrial complex to state repression worldwide. We March to oppose efforts that deny our communities’ rights and that brutally erase queer people worldwide. We March against domestic and global neoliberalism and the ascendance of the far right, against poverty and economic inequality, against U.S. military aggression, and against the threat that is climate change. We March to affirm that healthcare is a right, including treatment for all people with HIV/AIDS worldwide and intensive prevention efforts, and to demand an end to HIV stigma and criminalization. We are trans, bisexual, lesbian, gay, queer, intersex, asexual, two-spirit, non-binary, gender non-conforming + and allies. We March to celebrate our communities and history, in solidarity with other oppressed groups, and to demand social and economic justice worldwide—we March for Liberation!